India may have suffered a 1-4 defeat to England in the recently concluded Test series, but Virat Kohli continues to stay upbeat. India kept the battle going till the final session of the fifth Test, at The Oval, with KL Rahul and Rishabh Pant both scoring hundreds. Unfortunately, a collapse in the final session, not helped by an insipid tail, meant India went down by 118 runs. What went wrong in the England series? 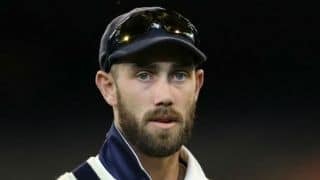 “We were not able to hold that pressure for long enough with the bat and the ball as well, so at crucial stages we could not keep that pressure on for long, and that is why they took advantage of those situations better than us. “We said at the end of the fourth game that we won’t throw in the towel and we didn’t. This kind of series shows you exactly the kind of character of individuals and I see that as an opportunity and not adversity because if you keep winning all the time a lot of faults are swept under the carpet, you don’t realise the faults you need to work on. “More often than not we have given the advantage to the opposition rather than them brilliantly turning around a situation,” Kohli admitted. “We can’t warm up in to a series because the first Test is always crucial, and we need to make sure we are in the right frame of mind to be able to do all the things right to strike first. “We’ve had conversations around specific situations we were in and why they went away from us. A lot of time it’s been on missed opportunities. It’s literally one part of a session that we’ve given away and the whole Test match starts running away because the opposition senses it and they are more relentless about being on top. “We have definitely spoken to individuals understand what they were thinking in certain situations. But of what happened on the field, why it took place and what was the thought process behind it, so that we can go totally into the root of the issue and try and correct it form there rather than just telling guys this was the cause and then you need to correct yourself,” Kohli told. How did the team approach the final day? “The one thing that we spoke about was how we react to the fifth day’s play is going to determine a lot of what happens in the future for all of us. It is very easy to surrender and say its too difficult or we might not be able to do this. 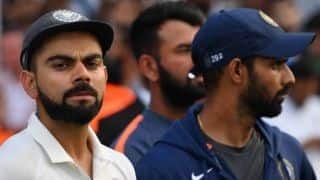 Kohli also assured that the team will not be satisfied with the occasional overseas Test win: “We do not look at this series as something that makes us think we can’t play in overseas conditions, of course we can play, but can we capitalise on the important moments better than the opposition? At the moment, no, we haven’t done that, but in future, we want to do that, and that is the only way we win series and our aim is to win series, not to win the odd Test match and be happy about it.